Chen Yi was born in 1901 in Lochi near Chengdu, Sichuan, into a moderately wealthy magistrate's family. 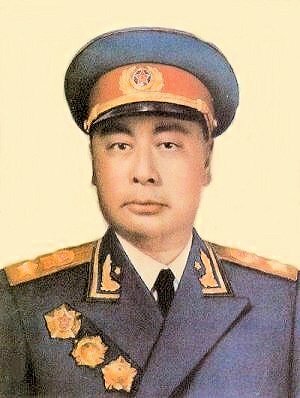 Chen Yi (pronounced Chun Ee) was left behind at the beginning of the Long March to direct military operations in the old Communist zone. Chen had been wounded six weeks earlier with a bullet in the hip that had not healed. He was a short stocky but a cultured man, outspoken, and outgoing. He an excellent poet, second only to Mao and was known for his sense of humor. He had few troops, 25,000 to 30,000 with about 10,000 of those wounded and of those, not more than 6,000 to 7,000 had ever held a rifle in their hands. The Nationalist forces constantly harassed them so that by December 1934, losses were so great that they were forced into guerrilla warfare. By then their numbers were down to 2,000 troops and 2000 wounded. On February 14, 1935, Chen called upon the peasants in the area to take the wounded soldiers into their homes as sons. "They will make good sons, marry your daughters and will be hard workers," said Chen Within a half day every wounded soldier had been placed with a peasant family, dispersed invisibly into the countryside. Each was supplied with several silver dollars, medicine for treating their wounds, and 5 pounds of salt (a priceless gift). On March 4, 1935, the remainder of Chen's forces, numbering about 1800 men marched out to join the rest of the Red Army. They were to travel for the next three years. They broke up into smaller groups. The KMT put out a reward of 50,000 yuan for the capture of Chen and his political commissar Xiang Ying. Chen and Xiang slipped through KMT lines in disguise. A few days later remnants of their forces joined them. They were down to groups of 80 men. There had been fearsome losses. Chen's hip had not healed and by June 1935, he couldn't walk. Chen tied himself to a tree so he would not shake with pain while he poured Tiger Balm medicine into the putrid wound on his thigh. The thigh soon improved. By December 1936, he made his way to Yan'an to Mao, never sleeping in the same place twice. At the founding ceremony of the People's Republic of China, on October 1st, 1949, Chen Yi was on the reviewing stand with Chairman Mao. After the declaration of the People's Republic he became the Chief of Shanghai and later the first Foreign Minister. Rabid Red Guards seeking to seize the Foreign Ministry and depose Zhou Enlai attacked him. Chen Yi was hauled before a struggle session and beaten. Zhou Enlai rescued him and led him away. Chen lost his office, his freedom, his health, and died January 6, 1972. The death certificate stated cancer, but the real cause was the epidemic called the Cultural Revolution. Marshals Zhu De, Ye Jianying and Zhou Enlai attended the funeral. Mao appeared at Chen's funeral services clad in pajamas. Chen Yi's funeral was Mao's last public appearance.